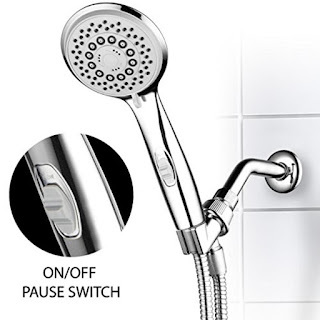 When I bought my house it had a cheap shower head in the shower and I have dealt with it for a long time, cleaned it a few times hoping for more pressure, but it didn't help much. It's one of those shower heads with a plastic face, just an old timey shower head. Time to replace it! I looked around trying to find the shower head I wanted, not too expensive but that would last a long time. I wanted one that could be used as an overhead shower head or could be hand held. One that would be easy to clean out if I needed to. While I was shopping around for one I found this one, HotelSpa 7-Setting Luxury Hand Shower With Pause. This is a very nice shower head and reasonably priced. It has features of some of the really high priced ones. It has a 5 foot super flexible stainless steel hose, longer than most of the hand held shower heads. I like that because when my grand babies are here and I'm bathing them they can stay sitting in the tub and I can easily rinse their hair. There are 7 settings, power rain,pulsating massage, stay warm mist,economy rain, rain/massage, rain/mist, and pause. I love the pause feature. You can hit pause, soap up, and then rinse, saving a lot of water. This shower head has an over sized 4 inch face with easy to clean rub-clean jets.Did I mention this was a tool free installation? It has conical brass hose nuts for easy hand tightening. This shower head is everything I was looking for.